India, it is often said, is not a country but a continent. From north to south and east to west, the languages are different, the customs are different and the country is different. There are few countries on earth with the enormous variety that India has to offer. It's a place that somehow gets into your blood. The plains are as flat and featureless, as the Himalayas are high and spectacular. The food is magnificent and transports are a mixture of exhilaration, boredom and are uncomfortable most of the times. Nothing is ever quite the way you expect it to be. India is far from the easiest country in the world to travel around. Indian Wildlife Tour with Pink Mountain Treks and Expedition will take you to 13 Nights 14 Days – Delhi – Sawai Madhopur – Ranthambore – Jabalpur – Bandhavgarh – Kanha – Pench – Nagpur wildlife Toour.India have world's largest Tiger population.Which is about 2200.It's world's half of the tiger population including Royal Bengal Tiger.Rhino, Elephant, Pythan, Birds, Deers, Snow Leopard, Lions and many more are the habitats of Indian Jungle. Day 1Arrive at DelhiUpon arrival at New Delhi meeting and assistance with our correspondent and transfer to the hotel of our choice. Overnight stay at hotel. Day 2DelhiRelaxed breakfast at hotel, followed by a full day guided tour to Old Delhi & New Delhi visiting Jama Masjid, Raj Ghat, Red Fort and Chandni Chowk, Qutab Minar, Humayun's Tomb, India Gate (memorial to the Indian army soldiers who died in World War 1), Rashtrapati Bhawan (formerly the viceroy’s reseidence), Parliament house and Government buildings, and the Lakshminarayan Temple/Gurudwara Bangla Sahib. Overnight stay at the hotel. Day 3Delhi – Sawai Madhopur – RanthamboreEarly morning after breakfast at the hotel transfer to railway station to board train to Sawai Madhopur. Arrive at Sawai Madhopur Junction. Assistance on arrival and transfer to your hotel. Evening jungle jeep or canter safari in Ranthambore National Park. Overnight stay at the hotel. Day 4RanthamboreMorning and evening jungle safari in the park. Dinner and overnight stay at hotel. Day 5Ranthambore – Sawaimadhopur – JabalpurMorning and evening jungle safari in the Park. Later in the evening check out of the hotel. An early evening dinner to depart for the railway station to board the overnight train to Jabalpur. Overnight on board the train. Day 6Jabalpur – BandhavgarhArrive at Jabalpur where you will be met by our representative. Drive to Bandhavgarh National Park, a wildlife retreat where history and nature meet. Bandhavgarh is set amidst the Vindhyan ranges. The park has a series of ridges running through it. This park was the former hunting preserve of the Maharaja of Rewa and at present is a famous natural hub for White Tigers. White Tigers, now a major attraction around the world's zoos, were first discovered in Rewa, not far from here. The terrain is broken, with rocky hill ranges, running roughly east west, interspersed with grassy swamps and forested valleys. Evening jungle safari in the Park. Dinner and overnight stay at hotel. Day 7BandhavgarhMorning and evening jungle safari in the Park. Dinner and overnight stay at hotel. Day 8BandhavgarhMorning and evening jungle safari in the Park. Dinner and overnight stay at hotel. Day 9Bandhavgarh – KanhaMorning after breakfast drive to Kanha Tiger Reserve. Kanha Tiger Reserve, comprising parts of the Mandla & Balaghat districts of Madhya Pradesh, and located in the "Maikal" hills of the Satpuras, is internationally renowned for its rich floral and faunal attributes. The Reserve is an excellent interspersion of the Dadars (flat hill tops), grassy expanses, dense forests and riverine forests. It is very rich in flora, largely due to the combination of landforms and soil types, apart from the moist character of the region. The rich habitat diversity of the Reserve supports a wide range of wildlife species along with innumerable lesser life forms, and is the sanctum sanctorum of many typical Central Indian fauna. Besides harbouring a viable population of the tiger, Kanha has distinguished itself in saving the endangered hard ground barasingha from extinction, and supporting the last world population of this deer species. Evening jeep safari at the Kanha Tiger Reserve. Dinner and overnight stay at hotel. Day 10KanhaMorning and evening jungle safari in the Park. Dinner and overnight stay at hotel. Day 11KanhaMorning and evening jungle safari in the Park. Dinner and overnight stay at hotel. Day 12Kanha – PenchMorning after breakfast drive from Kanha to Pench. 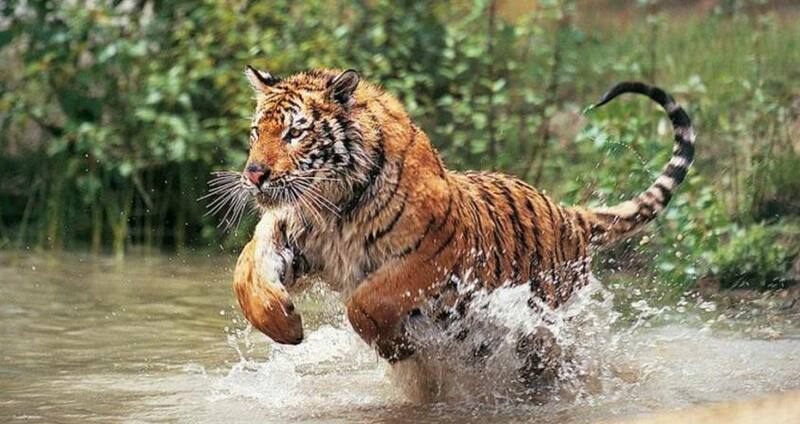 The Pench Tiger Reserve is named after the Pench river, which flows from north to south through the Reserve. The Reserve is located in the southern reaches of the Satpura hill ranges in the Seoni and Chhindwara districts in Madhya Pradesh. The terrain is undulating, with most of the area covered by small hill ranges, steeply sloping on the sides. The park is known for its natural beauty, richness in flora and fauna. As the prey concentration is high along the Pench river, tigers usually inhabit this belt. Wild dogs are commonly seen in packs of 12 to 15, near Chhedia, Jamtara, Bodanala and Pyorthadi areas of the Reserve. Upon arrival in Pench transfer to hotel. In the evening jungle safari at the Park. Dinner and overnight stay at hotel. Day 13PenchMorning and evening jungle safari in the Park. Dinner and overnight stay at hotel. Day 14Pench – Nagpur – Delhi or MumbaiMorning is free at leisure. In the afternoon drive to Nagpur airport to board flight to Delhi or Mumbai connecting with your onward international flight back home.